The annual outing of the Social Committee of the Dispensaire (DF-SFB) took place in Brighton on June 11th, 2018. The bus left the Dispensaire in Hammersmith at around 10am for a joyful and emotional day. After a walk on the beach front to build up an appetite, the happy group enjoyed a gourmet lunch at a local restaurant. A truly convivial time! 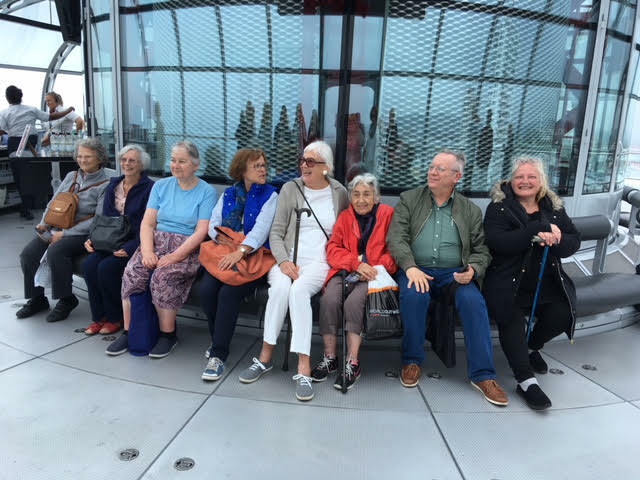 Then all nine members of the groups and the ten companions boarded the British Airways i360. Gently climbing up to 140m, they admired 360-degree views across Brighton and Hove, the South Downs National Park and the Coast. Finally, to recover from all the emotions, the bravest were able to enjoy a quick dip in the sea before heading back to London. It was a beautiful day, full of joy, good humour and solidarity. Congratulations to the volunteers for the flawless organisation and a huge thank you to the generous sponsors making this day possible.